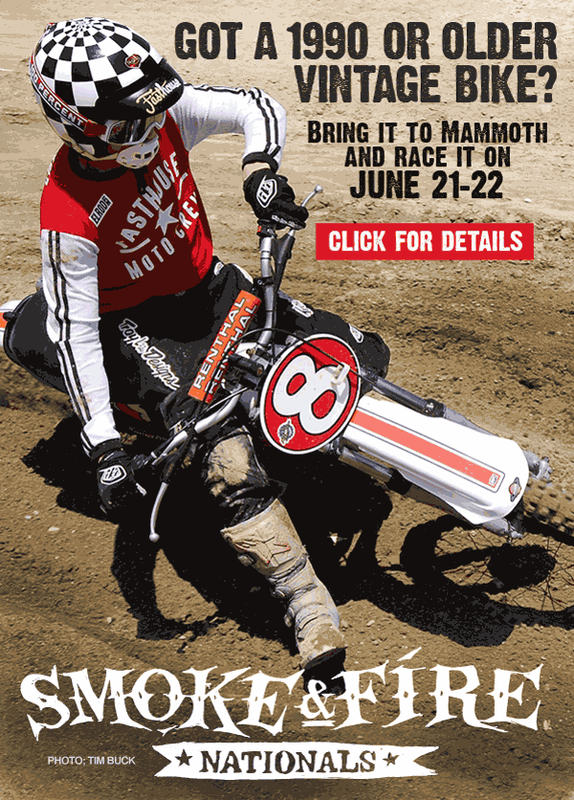 Troy Lee Designs and Fasthouse present the first annual Smoke and Fire National at Mammoth Motocross on June 21-22, 2014. The four-lap, Vintage Sprint Race follows the traditional two-moto format of the Mammoth Vet Weekend. Vintage racers will enjoy the prime, untouched track at Mammoth Motocross, starting off each day with the Star-Spangled Banner and a moto. Smoke and Fire National riders will race one moto each morning before heading out to enjoy the festivities for the afternoon. For details visit mammothmotocross.com. Follow Mammoth Motocross on Facebook andTwitter, and @MammothMotocross on Instagram for the most up-to-date news on the Smoke and Fire National as it unfolds.